Microsoft AI has been moving fast to set out its Artificial Intelligence agenda and direction. We found this great summary of this summer’s London event announcements at Microsoft’s news site. Microsoft has laid out its vision for Microsoft AI (artificial intelligence), which puts people at the heart of intelligent technology to empower them to achieve great things. The company is dedicated to democratizing Microsoft AI for every person and organisation, making it more accessible and valuable to everyone, and for the past 25 years Microsoft Research has contributed to advancing state-of-the-art computing through its groundbreaking basic and applied research that has been shared openly with the industry and academic communities, and with product groups within Microsoft. 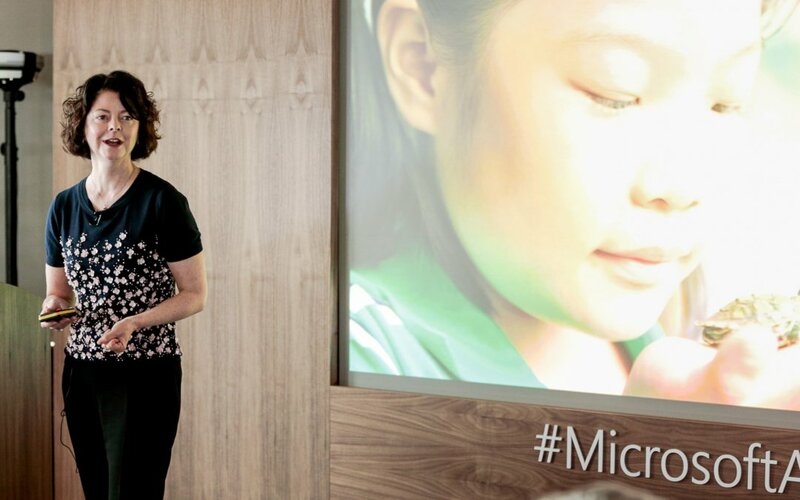 In the latest step on the Microsoft AI journey, Harry Shum, Executive Vice-President of the Microsoft AI and Research Group; Eric Horvitz, Technical Fellow and Director at Microsoft Research Labs; Chris Bishop, Technical Fellow and Laboratory Director at Microsoft Research Cambridge, and Emma Williams, General Manager at Bing, announced plans at the Microsoft AI event in London to use technology to address some of society’s most fundamental challenges. Horvitz spoke about AI for Earth, which puts the power of Microsoft AI towards solving some of the biggest environmental challenges of our time. Microsoft is investing more than $2 million to help tackle issues related to water, agriculture, climate change and biodiversity across the world. As well as offering access to cloud and AI computing resources, Microsoft will supply technology training sessions and lighthouse projects. Lucas Joppa, longtime Microsoft Research lead on computational ecology, will head-up the programme as chief environmental scientist. “AI will have a transformative effect on a range of sectors – from education and transportation, to agriculture and healthcare,” Horvitz said at the event. “AI can also do a lot for social good. How can large-scale data sets be used to help people in the developing and developed worlds? Microsoft will set up a new research and incubation hub within Microsoft Research to address the most difficult challenges of AI. It will bring together engineers, researchers and experts, who will probe the foundational principles of intelligence, including efforts to unravel the mysteries of human intellect, and use this knowledge to develop a more general, flexible artificial intelligence. Microsoft is exploring new AI design principles and an Ethical Design Guide for AI. Based on AI principles that Microsoft’s Chief Executive, Satya Nadella, shared publicly last year, Williams announced an Ethical Design Guide for AI product development. While human ingenuity amplified by intelligent technology could unlock the next big leap for humanity, this tech must be optimised for people’s needs and wants, she said. It needs to understand the emotional and intelligent needs of people to ensure they can connect with colleagues, family and friends without interference from computers; honour societal values; understand context and evolve over time. Seeing AI is a Microsoft research project, available as a free iOS app, that helps blind and low-vision people harness the power of AI to open up the visual world. The app can speak text as soon as words appear in front of the camera, provide audio guidance to capture a printed page, identify products via their barcodes and recognise saved friends and the area around the user. A new partnership with machine learning expert Max Welling from the University of Amsterdam to help further the development of this technology was announced. “We live in exciting times, and are seeing the biggest transformation in computing since Alan Turing,” Bishop said. We are seeing a shift from software that is handcrafted to software that learns from data. Microsoft introduced a number of updates to Microsoft Cognitive Services, a collection of services that enables developers to easily add intelligent features – such as emotion and sentiment detection, vision and speech recognition, knowledge, search and language understanding – into their applications. The updates include a new Bing Entity Search API and availability of the Project Prague gestures SDK and Presentation Translator. Bing Entity Search lets you send a search query to Bing and get back search results that include entities and places. Place results include restaurants, hotels or other local businesses, while entity results include persons, places or things. Project Prague gestures SDK, from Microsoft Cognitive Services Labs, is a cutting edge, easy-to-use SDK that helps developers and UX designers incorporate gesture-based controls into their apps, and helps to quickly define and implement customised hand gestures, creating a more natural user experience. Presentation Translator, a Microsoft Garage project, is a PowerPoint add-in that gives presenters the ability to add subtitles to their presentations across the same language or more than 60 different languages. Audience members in the room can also follow along with the presentation in their own language, including the speaker’s language, on their phone, tablet or computer by using a QR code. This feature can also be used for audiences who are deaf or hard of hearing. The Microsoft Translator live feature is built using Microsoft Translator core speech translation technology. Text, pictures and clips courtesy of Microsoft’s reporters at Microsoft News Centre UK. Want access to some powerful online training resources and the latest news about Microsoft AI, Dynamics 365, BI and other related products? Then press the button below to register with us…..